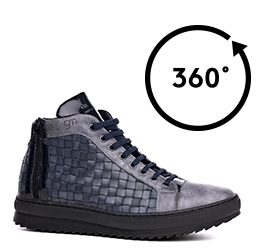 Mid-top elevator sneakers with upper made of three precious leathers: speckled gray calf leather, dark blue patent leather adorning the side zip and tongue, hand-painted braided leather with blue shades on the sides. The black sole is made of natural rubber. A ready-to-wear shoe with a modern and elegant design, featuring an invisible inner elevator system able to increase height from 2 (5 cm) up to 2.75 inches (7 cm) . Made in Italy.